Our Eco-Tour is one of the most exciting and sought after on Oahu. This extravagant and activity filled island tour features a refreshing waterfall swim, historical guided journey of Waimea Valley, and a chance to stand up paddleboard or kayak on the Anahulu river or shop through historic Haleiwa Town. Enjoy a delicious lunch with North Shore favorites, and Hawaii’s famous shaved ice. Round off your day checking out the surfing beaches of the North Shore, the beautiful Byodo-In Temple, and the breath taking view of the Pali Lookout. Come join us on an activity filled exploration of Oahu’s North Shore and lush rain-forests. Our expert navigators will take you to experience the North Shore’s famous beaches and all its natural beauty. Stand up paddleboard or kayak along the Anahulu River, or choose to shop and explore historic Haleiwa town. Afterwards, enjoy a delicious lunch at Tsue’s Farm complete with local favorites and shaved ice. Next, explore the beauty of the Waimea Valley as you learn about the native flora and the rich Hawaiian history of the valley on your way up Waimea Falls, where you can swim in the waterfall. Enrich your time in Hawaii with knowledge and education provided by our highly-trained expert navigators about the flora and fauna of our islands. After your time at Waimea Valley, you will journey along the rest of the North Shore to sightsee Hawaii’s world famous surfing beaches. 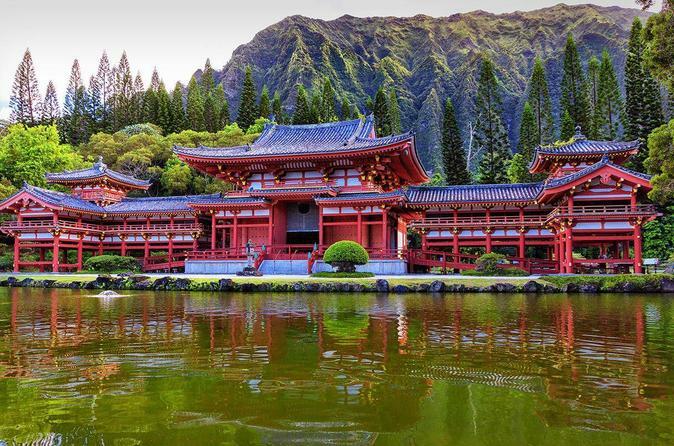 Complete your eco-tour with taking in the serene Byodo-In Temple, and witness the stunning views from the Nu’uanu Pali Lookout.